American express is offering 50$ off of $200 on Travelocity for GoodBuy and Top Secret hotel bookings. To get the offer, first log on to your American express account and look under "offers for you tab". You should see the offer in the list below. This may be a targeted offer so you might not see it listed for you. 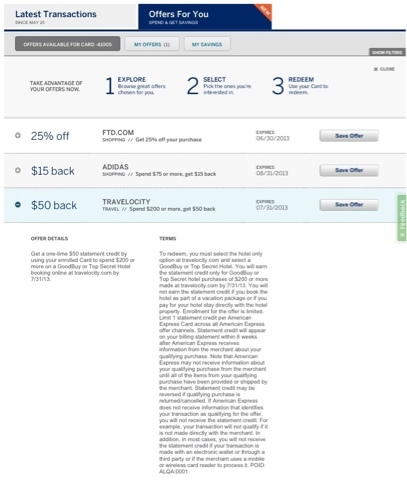 Get a one-time $50 statement credit by using your enrolled Card to spend $200 or more on a GoodBuy or Top Secret Hotel booking online at travelocity.com by 7/31/13.